Kunming is the capital city of Yunnan province, which is located in the southwest of China. Kunming has a long history of more than 2400 years. It is also the political, economical and cultural center of Yunnan province. Kunming is also the gate way to the southwest of China which bordering India and Myanmar. In recent years, Kunming has been developed into a tourism destinations in China. There are much to see in Kunming city. Famous attractions in Kunming are Dianchi Lake, Stone Forest , the Village of Ethnic Culture, Grand View Pavilion. In the city, you will find many hsitorical sites and many beautiful highland karst landscape. The famous Stone forest is known to most of the Chinese people who are interest in tourism. Kunming has a mild climate and weather. It is called Spring city in China. The temperature here is not too high in summper and not too low in winter. So you can plan your trip to Kunming at any time you want. The average temperature in summer is 24 °C and 15.4 °C in Winter. With its perpetual spring-like weather which provides the ideal climate for plants and flowers, Kunming is known as the "City of Eternal Spring". The city is covered with blossoms and lush vegetation all the year round. Kunming is rich in natural landscape especially the Karst landscape. Famous attractions are including Dianchi Lake, Stone Forest , the Village of Ethnic Culture, Grand View Pavilion. Here are a list of the most famous and popular sightseeing spots in Kunming and around. Kunming is the capital city of Yunnan province. 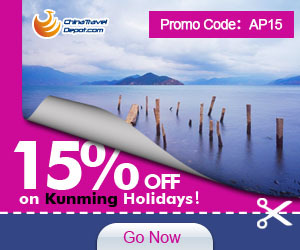 You can travel to Kunming by air, trains, long distance buses. Kunming Wujiaba International Airport lies in the southeastern outskirts of Kunming City, only about four kilometers (about 2.5 miles) away from the downtown area. The famous food streets of Kunming are Shuncheng Food Street, Baoshan Food Street and Beidamen Food Street where travelers can enjoy various kinds of snacks with strong Kunming flavor. Kunming offers many local products. The interaction of different cultures, religions and colorful lifestyles offers visitors so much to see and buy! It is an ideal place to find local products and souvenirs of your trip to Yunnan! Kunming is famous for local handiwork including ivory and woodcarving, Dai Jin (brocade made by Dai artisans), and Dai Zhu Bian (Dai bamboo basketry). 1.The zip code of Kunming is 650000 and the area code is 0871. 2.You can use your credit card, traveler's check or cash to exchange for Chinese Yuan in almost every branch of Bank of China in Kunming. 3. While public phones are easily found in small shops along streets in Kunming, we suggest tourists make low-cost IDD or DDD calls in post offices or telecom buildings. 4. If you ask native Chinese where to find an Internet bar, they will tell you to find a university first because most Internet bars are located near colleges or schools. There are many Internet bars near Yunnan University with good speed and environment charging 2 to 3 yuan per hour.